CDT’s new Dielectric composite gloves ensure total safety to electricians while working in hazardous sites. These Dielectric composite gloves are made with superior quality raw materials; and innovative manufacturing of these gloves protect workers against mechanical hazards. 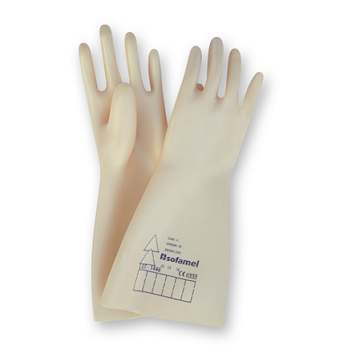 The firm grip that the outer coating of the gloves provides is suitable even in wet conditions. Our products are of superior quality and offer them to our clients at reasonable rates. You can place your orders with us and we will deliver your order on time. CDT’s Dielectric gloves are of superior quality and these comply with the European Standard EN 60903 and the International Standard IEC 60903 specifications. The monitoring of these Dielectric gloves includes the implementation of article 11b of the 89/686/EEC directive relating to Personal Protective Equipment, which ensures the equipment’s usage for live working in category III (mortal risks). We take every precaution to ensure that the products that we offer to our clients are of the best quality and these are extremely helpful in working environments with potential hazards. You can place your order with us and we will make sure that your order is delivered on time.